Do you know someone that was highly productive maybe participated in Bloomsday or the PTG, and now barely has any energy? Or perhaps you know someone that was a high achiever always making their goals and making life look easy, yet now they are having difficulty processing what to do next. They could be fighting daily headaches or is it nausea, vomiting, and diarrhea. We probably all know of someone like this if it isn't us. Some mold patients look great, and you wouldn't think they were even sick. Mold Illness is a real health problem. Mold produces and releases tiny spores which are small enough to be in our air, water, and even insect-borne. Mycotoxins are also produced from mold. Both spores and mycotoxins can cause health problems. One-quarter of the population is susceptible to chronic mold illness due to their HLA gene status. HLA are antigens that are found on the surface of cells. Antigens help the immune system label foreign invaders, however, people with a defect in the HLA gene will have difficulty clearing foreign invaders from the body. When the body is under constant attack from foreign invaders the immune system can not handle it, thus the label Chronic Inflammatory Response Syndrome. Mold illness is hard to distinguish from other autoimmune diseases and often has similar symptoms as chronic Lyme's Disease. People with RA, Psoriasis, Lupus, Hashimotos, IBD, and Graves Disease often are triggered by mycotoxins. At Rivercreek Wellness, Dr. Julie George works with the leading laboratories in the nation. We recommend testing for molds and mycotoxins as well as checking other blood markers. Mycotoxins and mold are often problems that need to be addressed with people living with chronic illness. 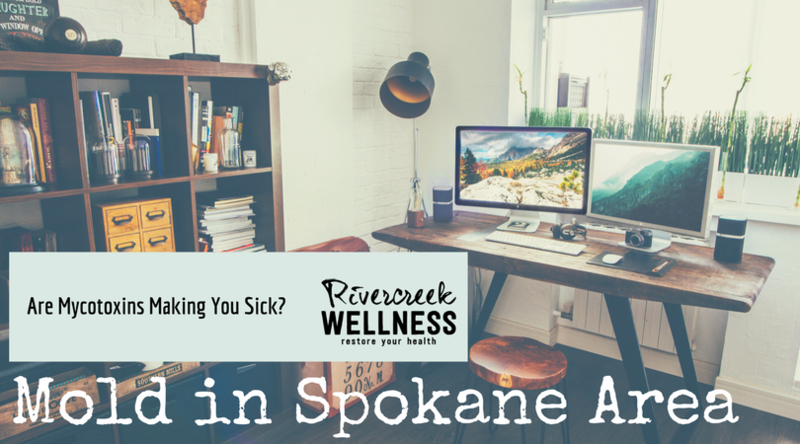 When I moved to Spokane I inquired about mold with inspectors, real estate agents as well as physicians. Do you know what the majority of them said? "Mold, you don't need to worry about that on this side of the state." I was dumbfounded by that response. Mold is all around us. We have water pipes in our homes, it rains and snows, right? According to OSHA, the Occupational Safety and Health Administration, 1/4 of US buildings are water damaged. Just because your home or office hasn't been flooded, hit by a hurricane, or had pipes burst, doesn't mean you are free of mold. A lot of the times the mold is not on the surface, therefore not visible to our eyes. Your average insurance mold inspector is not enough. It is important that you work with a professional that runs the correct mold and mycotoxin testing. Even I have hired the wrong local companies for testing. We are developing relationships with a few trusted companies that offer great testing and advice. This content is not intended to diagnose or treat your health conditions. If you have any questions regarding your symptoms or health please contact your primary care physician.